This series of interviews is based the Test_Lab “Clothing without Cloth” which took place at V2_ Institute for the Unstable Media in Rotterdam, May 2011 and featured: Emily Crane (UK), Carole Collet (UK), Christien Meinderstsma (NL), Grado Zero Espace (IT), Pauline van Dongen (NL) and Freedom Of Creation (NL). The English gastronomical wizard Emily Crane works at the intersection of molecular cuisine and textiles “cooking” material substrates which makes us re-think the future of clothing, fabric and our uses of materials. For the Test_Lab “Clothing without Cloth” event Emily performed a live demonstration of her “Micro-Nutrient Couture” project, mixing potions and food bi-products to produce malleable and edible second skins. I studied fashion and textiles for the first two years of my Bachelors Degree at Bath Spa University, specializing in womenswear in my final year. I then progressed to study MA Fashion at Kingston University London. What led to your interest in fashion and food? I had a very natural progression through my practice into the use of food bi-products for textile purposes. I had looked at alternative processes for fashion production, mainly in my day-to-day life, and worked specifically with the processes found in the kitchen focusing on molecular gastronomy. I spent two weeks working around the clock in my transformed garage/studio with my freezer parked outside continuing my experiments and attempting to make meterage. Please describe your studio: where are you located, how many designers/technologists work with you, and how are the garments produced? As “Micro-Nutrient Couture” was my MA final collection at Kingston University London, my “studio” was really split over a number of locations. Most of the experimentation took place at home in my kitchen in London, with the living room as the drying and forming space. My colleagues at Kingston who were making couture dresses out of silk were not too happy with my occasionally messy approach to design! However, when it came to the production of larger scale pieces I rented a walk-in freezer trailer which had to be parked on my mum’s front lawn on the other side of the UK in Bath, Somerset. I spent two weeks working around the clock in my transformed garage/studio with my freezer parked outside continuing my experiments and attempting to make meterage. This project was independently created, however I did have the support of friends and family mixing recipes for me, which without them I would not have gotten to the stage I did. How does the environment you work in influence the designs you make (i.e. access to technology/ specialists)? I feel that if I were to do this project now that I am working outside the constraints of education I would have spent a lot more time working with collaborative partners to extend the knowledge of the foundations the project was built on. Therefore the project would have had more sustenance. I very much like the idea of using bi-products to create. As base materials for “Micro-Nutrient Couture” I let the processes I was looking at inform the material usage leaning towards gelatins, pork, beef and seaweed. Do you collaborate with technologist/laboratories, and if so, whom and how does this effect the choice of technologies and materials? I have collaborated in the past over this project with the Experimental Kitchen at The Fat Duck in Bray, UK. Having an open dialogue with Stefan and Jocky progressed the material usage and processes I had been using previously. Can you tell us more about this collaboration and how it came about? It was really very simple. I contacted the company explaining what I was in the process of doing and they asked me to produce a small proposal for them. I was then invited for an afternoon of experimentation at the Fat Duck’s Experimental Kitchen which furthered my knowledge in this new field of research. How much do the materials and technologies used in the designs influence the aesthetics? Or do the aesthetics dictate the technologies and materials, and how? “Micro-Nutrient Couture”’s experimental nature meant I embraced the organic shapes that were emerging. Letting process inform form led the project to further any expectations I had had which created the opportunity for a new aesthetic. The aim was never to create a traditional aesthetic, almost to challenge it. I have always been fueled as a designer to provoke and prove concepts. What are the challenges for you as a fashion designer working with food? Mostly the challenges are people’s perception of the work. Mention “edible dress”, and most people think of it as a gimmick. However I have always been fueled as a designer to provoke and prove concepts. Also the product currently is not a viable material and it needs a lot more research into the materials and processes which is why I am currently writing up a proposal to further this projects research. The luxury of being able to wake up and prepare your own individual piece of couture, hand crafted using “survival” techniques is all part of the alchemy. 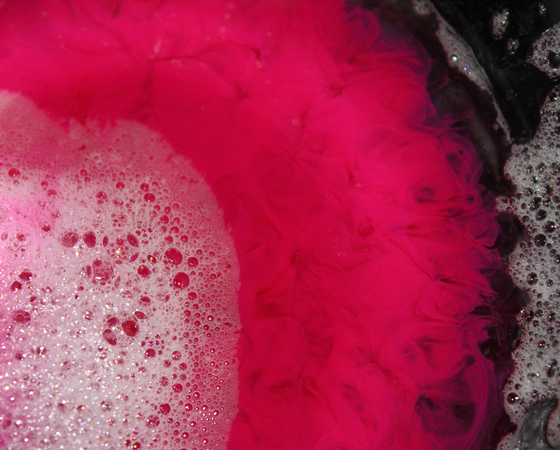 What do you think food / molecular gastronomy brings to the craft and role of fashion? I feel that craft and the role of fashion are two different things here, although they do beautifully weave into the same story. Obviously this sort of production is pushing back to cottage industry, locally sourced/made if not in your own hi-tech kitchen/wardrobe. The luxury of being able to wake up and prepare your own individual piece of couture, hand crafted using “survival” techniques is all part of the alchemy. However the fact that this couture is ingestible opens a whole new world of possibilities within the classic “fashion” role. “Micro-Nutrient Couture” certainly questions the hybridity of the fashion practitioners role as well as fashion itself. 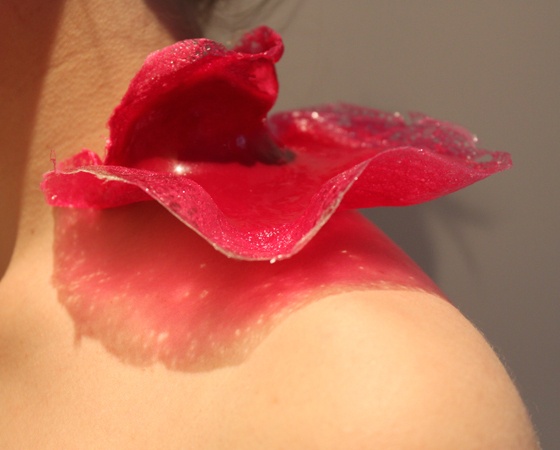 If garments can become ingestible they become a vessel for medicine, nutrients, technology etc into the body. Once the fashion practitioner is sat in between practices and industries and starts to straddle roles, the design horizon is blown away. The other major point for me on the ingestible side is that there is the potential for fashion to no longer end up in landfill. With the current high street demands of “the constant new” and the mass production with throw-away prices, this concept enables the body itself to dispose of its own couture. Do you see food taking on a new artistic and functional role in design such as in the works (architectural jellies, for example) of Bompas and Parr’s aestheticized and highly designed food? Yes I do. I feel any bi-product or material that can be used as an energy source will become a very precious commodity and as humans we not to like naturally unattractive resources. My Major Project focuses on creating fashion using boundary-less techniques from the everyday — I cook, blend, culture and form ice bubbles as silhouettes. 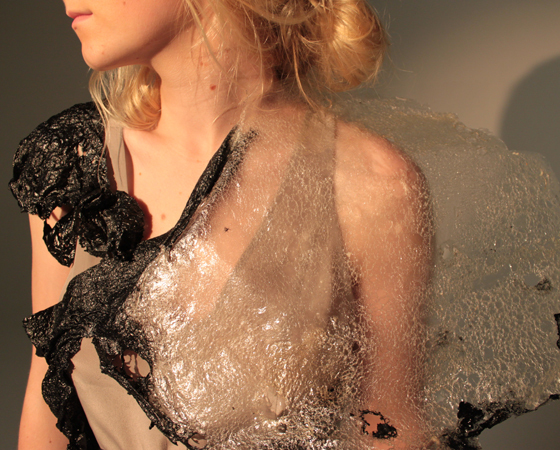 Could you further describe the work that you showcased at the V2_ Test_Lab “Clothing without Cloth” event – “Micro-Nutrient Couture” – what is it? Food? Clothes? Design? “Micro-Nutrient Couture” evolved from a restrictive brief based on the premise of zero resources to create fashion futures; without the current mass production capabilities available what would a fashion practitioner do? “Micro-Nutrient Couture” aims to create a fashion experience in a world exploring “the constant new”, offering a fresh alternative to the compulsive shopper obsessed with fast fashion, high street consumption and throw away prices. My Major Project focuses on creating fashion using boundary-less techniques from the everyday — I cook, blend, culture and form ice bubbles as silhouettes. “Micro-Nutrient Couture” is a sensory world of transient fashion where no one but the individual will ever wear the same dress again. Through this unique process and development of new materiality I have laid an innovative creative foundation for future fashion design, conscious of the restraints of our future planet and the impact from current fashion cycles. My methods look towards “survival” as a key factor informing my processes. Fashion is no longer a thing of simple beauty, but of nutrition also. I experiment with materials that occur naturally when cooked up from edible ingredients including gelatins, kappa carrageenan, agar-agar sea vegetable, water, natural flavor extracts, glycerine, food coloring and lusters, this is high tech kitchen couture. Was this interest in food-couture / couture-food based on a lack of “edibles” in fashion or a lack of “garments” in molecular cuisine? It wasn’t either really it grew from an interest in ‘survival processes’ to create fashion, processes that I believed would outlive some of the less important ones. 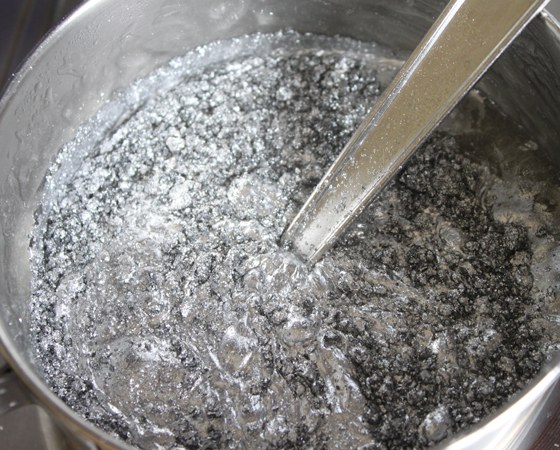 For example, I felt that the processes involved in cooking and the preparation of food would have more longevity in our production futures over other current mass manufacturing techniques. From where are the materials in “Micro-Nutrient Couture” sourced? What are they and how do they “work”? The base materials for “Micro-Nutrient Couture” are mainly gelatins as they give such a stable and flexible light weight material. Generally they are bought from super markets. Each sample and method has a different recipe. If I gave away the recipes then any one could potentially make specimens. The thought of being able to potentially program a/your skin to react and adapt to either your environment or mood entertains my mind no-end. What is your stand on bio-tech and genetically modified organisms? Can we escape this? Is it all bad? Or is it perhaps necessary for the survival of some biological organisms? From a fashion point of view these topics and their developments excite me hugely. The thought of being able to potentially program a/your skin to react and adapt to either your environment or mood entertains my mind no-end. The magic and alchemy bound into the potentials opens a whole new world of creativity and concepts. How likely is it that we are going to wear “food”? What does molecular cuisine bring to the craft of fashion? I feel that food and food bi-products are a valuable resource for transient textiles. A much more environmentally friendly approach to fibers. How do you situate your work in relation to Susanne Lee’s “victimless leather” – where she is “growing” leather as an environmentally friendly alternative to leather? As we are both using food bi-products we obviously sit closely. However Suzanne is 10 years into her practice and has made huge progressions within her processes. I can only hope to be as accomplished as Bio-Couture in 10 years time. Do you also see the practice in “Micro-Nutrient Couture” as a D-I-Y one? For example, the cookbook belongs to the culture of “Instructables” – do you imagine the same with your project that it can/should be “taught”? Definitely “Micro-Nutrient Couture” was always designed and thought of as an individuals process. There was a part in the concept for the elite when they may have a chef to produce their wardrobe but the norm would be to wake up every morning and open your wardrobe door into a lab/freezer/kitchen, a world of high-tech kitchen couture. If I were to package MN-C I would definitely use a mystical language to inform and tell the story of the recipes and ingredients to protect the further development. Do you plan on distributing the recipes, or will they remain “secret”? I see the recipes as the magic equation, 2y+45ac X H2O + heat = BioLace 24. It’s important to keep the recipe a secret to keep the alchemy bubbling. If I were to package MN-C I would definitely use a mystical language to inform and tell the story of the recipes and ingredients to protect the further development. What role does performance play in the presentation of your work? What are the links and differences with a cooking show for example? Performance plays a huge role in any new innovative design process. To be able to catch the onlookers’ imagination you need to materialize a product in front of their eyes for them to believe it. Especially with my methods and recipes, there is really not a lot of difference between what I perform and a traditional cooking demo. My tools may just be a little unusual… but it is usually a known object simply hacked into a new use. Christine Meinderstsma works in a very “cradle-to-cradle” approach, have you considered, like many chefs are currently doing, developing “Micro-Nutrient Couture” to reflect seasonal and local agricultures? Yes I have definitely thought about this aspect to the availability of produce, along with cultural differences and tastes. How do you envision using 3D printing technologies such as those used by Pauline van Dongen with Freedom Of Creation and what it might bring to the forms and materials you are working with? I think that 3D printing brings a whole new visible method of rapid production to the consumers vision which is fantastic for my project where I am beginning to look at rapid production from your freezer/wardrobe/lab every morning for day to day use. The materials and processes are different but it’s the idea planted that excited me.